Open and honest communication can foster trust, and trust is an essential component of a healthy relationship -- but the rock-solid trust you worked so hard to establish may crumble if you or your significant other crosses a boundary on social media. While you might think ‘friending’ an old flame on facebook is innocent enough, social media researcher Joyce Baptist says this move is capable of damaging a relationship. "Social media can enhance romantic relationships when it's used to stay in touch throughout the day or honor your partner's achievements, but there are pitfalls to avoid that could damage the relationship," said Baptist, an associate professor of marriage and family therapy at Kansas State University. Baptist says it’s important to make sure you and your partner are on the same page regarding social media. A lack of agreement regarding boundaries on social media can hurt a relationship, but having clear-cut boundaries as to what is and isn’t acceptable can help to preserve trust. To find out how social media affects relationships, Baptist studied nearly 7,000 couples who use social media. Her research showed that while some people accepted the fact that their partners interacted with old flames or flirted with others online, they weren’t always happy about it. Situations like these can take a toll on relationship satisfaction and interfere with the levels of care people receive from their partner, says Baptist. But a simple conversation regarding social media boundaries can help to protect a relationship from these situations. In addition to sharing what you are willing to tolerate, Baptist recommends sharing what you would prefer. Coming to an agreement regarding boundaries on social media can create a secure and satisfying relationship. "When you come across an old flame or another attractive person on social media, the question to ask is: Will communicating with this other person enhance my relationship or harm it?" she said. "Just because you see that your girlfriend or boyfriend from high school is on Facebook doesn't mean that you need to 'friend' them." Allowing a former significant other back into your life via social media can be a slippery slope, says Baptist, because people can be tempted to confide in their previous partner during the lower points of their current relationship. But ebbs and flows in a relationship are normal, and a low point doesn't necessarily mean that your relationship is doomed to fail. But Baptist says reigniting an old flame could, in fact, destroy your relationship. 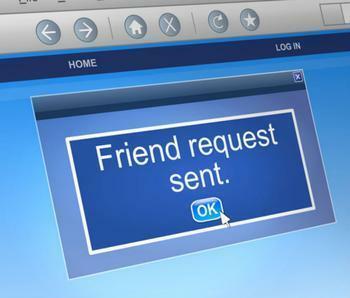 Biggest relationship threat -- Facebook friend or a face from the past?